Hello everyone and welcome to the Orchestra Programme for the year! We are very proud in St Catherine’s NS that we can offer everyone a chance to learn an orchestral instrument. What’s involved in the orchestra project? The children learn to play, to read music, to follow a conductor’s instructions, and to have fun making music with their friends; for many of them it will lay the foundation for appreciating and participating in music throughout their lives. Why do we have the orchestra project? There is a load of research now to show that learning to read and play music is a big benefit for children in terms of brain development. We also feel that music is an integral part of most people’s lives and that learning an instrument at a young age gives children the opportunity to take part in music actively and to express themselves through music. Finally, there’s a big social dimension; they have to listen to each other and work as a team. Junior and Senior Infants don’t participate in the orchestra project as such. However, in the infant classes the teachers deliver a comprehensive programme of songs, rhythms, movement to music, percussion, appreciation and even a little bit of composition. It’s called the “Ceol” programme. You can help by letting your child teach you the songs they have learned, by providing him / her with lots of music to listen to, by letting him / her play and experiment with simple instruments, and maybe by bringing him / her to some music events – for example, a band concert in the local park, or a “Family Day” in the Concert Hall. What about the Senior Orchestra? When children reach 5th and 6th Class, they are combined to form the Senior School Orchestra, and we are very lucky to have Hilda Milner teaching this class. Hilda is a parent in the school and has the great gift of energising and motivating the older children. The orchestra comprises violinists, recorder players, Kieran’s “woodwind” group and children who have learned other instruments outside school. The orchestra makes a great sound and it is wonderful to hear all the work of the previous four years coming together. So when do children start? We start the orchestra programme proper in 1st Class; the children already have a strong foundation to build on from their previous musical experience. They are divided into two groups, violin and recorder. We do try to accommodate a preference but to keep the numbers balanced, it’s not always possible to give a child their first choice. Who teaches the orchestra groups? Clare O’Brien teaches the violin group and Kieran Holt the recorder. They are both experienced music teachers and have been with us for a few years now, and the class teachers help and support them in their work. Naturally with group teaching there can’t be the same attention to an individual child that there would be in a private music lesson, but the children do gain in motivation by learning with their friends. Our policy is that the violin and recorder groups are taught separately, especially at first, but then combined regularly to play tunes together. The lessons with Clare and Kieran continue for four years. In 3rd and 4th Class Kieran offers the chance to a few children to try out some woodwind instruments – the flute, clarinet or saxophone. These are children who have made good progress with the recorder, are physically strong enough to manage the bigger instruments, and have expressed a genuine interest. As parents can understand, the orchestra is a significant cost to the school. We pay the music teachers and we also buy all the equipment – instruments, stands, music scores etc. 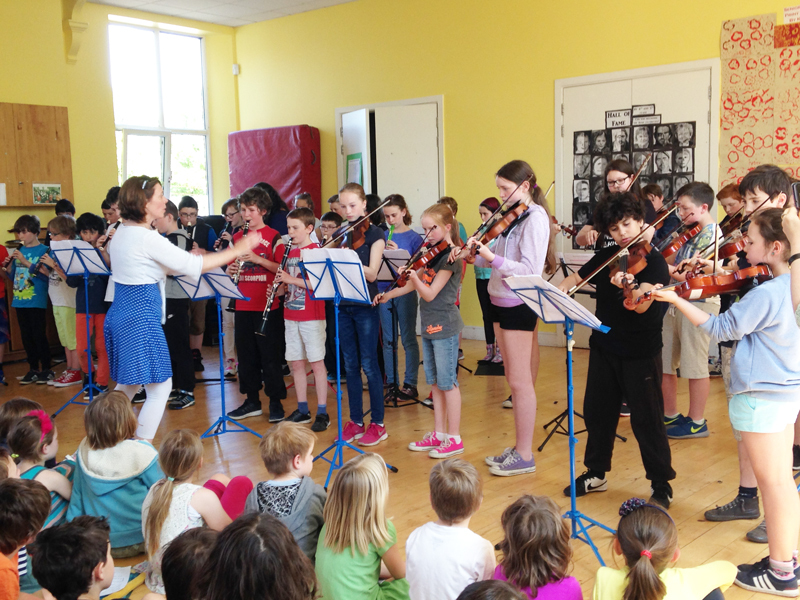 We do ask parents in all classes from 1st up to 6th to pay a contribution of €90 per year, which is far less than private music lessons would cost. However no child is denied the chance to learn their instrument and the contribution is voluntary. There’s no way out of this: the children must practise if they are to make progress. We suggest 10 minutes per day, Monday to Thursday (and don’t stop him / her doing more!!). We know that many parents don’t know exactly how to help, but even listening to the children having a go at their tunes is hugely encouraging for them. They should have a homework sheet to tell them what to do. Please do see it as part of their homework and insist that they do it just as you would insist on them learning their tables or spellings. If your child is totally confused as to what they have to do, come in and ask! Also, do come to the orchestra concerts and let your children know you are proud of them! And if your child shows a particular interest and aptitude, do consider getting them lessons; the College of Music and the RIAM are reasonably priced, and there is also the Leinster School of Music (based in Griffith College, very handy!) and the Leeson Park School of Music. There are also lots of private music teachers, including our own Clare O’Brien who takes violin lessons in our school in the afternoons. Dear Parents, Just a quick note about tomorrow evening: Children need to be at the CHURCH (the Church of St Catherine and St James, the red-brick church on Donore Ave), not the school, by 6:15 at the latest. The church will be open from 6 pm. The children should bring their music sheets with them. They need to have their instruments with them in school tomorrow for a final practice, and we will keep the instruments until the concert. Dear Parents, Please read the attached letter about our orchestra programme for this year and especially about an information evening for parents on Monday evening September 21st. There’s also a more general letter about the orchestra with lots of FAQs which you may like to read. Kind Regards, April.